So suddenly it’s April and Jett is almost 8 months old and I am 24 weeks Prego! Just an update, we enrolled Jett in the intermediate puppy class at Petsmart and he graduated last Saturday. After class, we took him with us to Home Depot to pick up a few things ( we have plans to put down sod and patio pavers in the backyard in the near future). 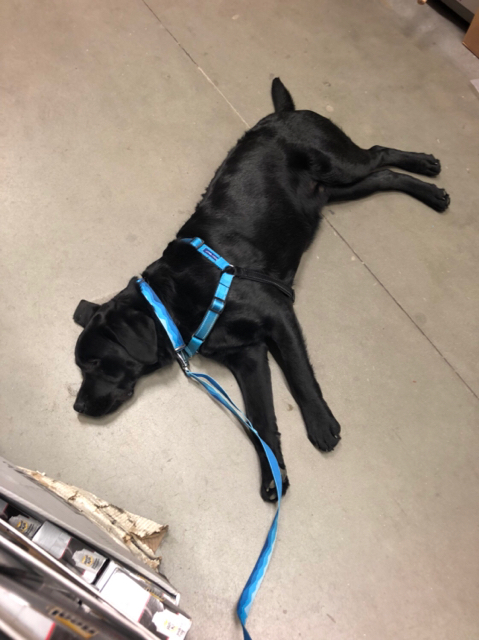 He promptly fell asleep in Home Depot. He is very different from Daisy / she would never sleep in a Home Depot. Some things I’ve noticed about him that I love - he doesn’t jump on people. He walks up and then leans in to them for a back rub. He did that a lot as a puppy and I guess this greeting got reinforced enough that he does it most do the time when he meets people. He is patient and smart and a little lazy- I take him on 2 mile walks and if I loop around the cul-de-sac instead of going straight home he plants his feet and wants to go home. He has some magic tricks up his sleeve. He will somehow open his crate on the middle of the night and come and lick my hand or Aric’s hand. I don’t know how he gets out but we just get up and put him back in. Also one morning last week I woke up and found him in his kennel but found he has thrown up outside and under his kennel... we have NO IDEA how he did it but it wasn’t Daisy because we could clearly see the shape of his food! Aric weighed him on our scale at home and he weighed about 77 lbs - that was about a week or more! We enrolled him the advanced class at the end of April and I hope to get his CGC and perhaps therapy certification if we have the time? He seems to have the personality for it. I will have to look into it more. We had an anatomy scan on our baby at 20 weeks and all looks good! We are expecting a boy! There's been a lot of sad news on this board in the past months. Thank you and Jett for giving us all something to smile about. Life is good for you and it makes us all happy. Congrats what a nice update. Congrats to you, your husband, and both puppets on all of your hard work and upcoming adventures! Congrats and more congrats!! Nice pics!